Many of our family roots are found in Rochester NY. Mom grew up there, and they spent much of their married life living in the City. 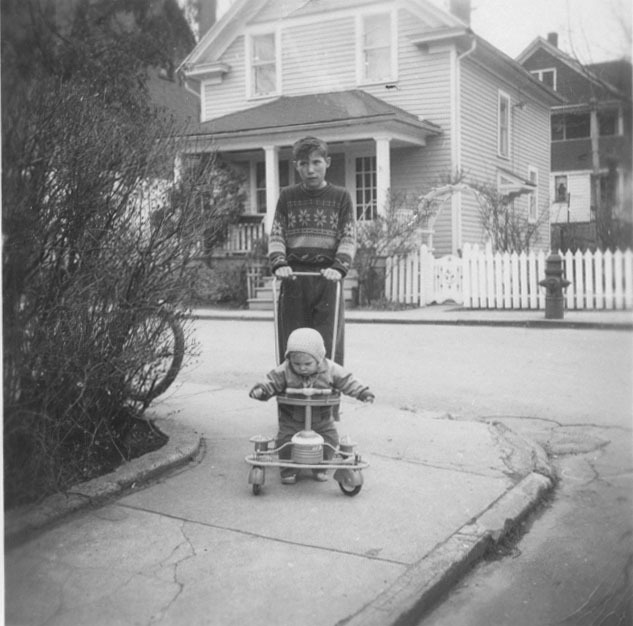 The photographs below were found among our family pictures and provide glimpse of that city life. I have left the photographs rather large so details of the surroundings can be seen. If anyone knows anymore details of the location or occasion, please let me know - I have numbered them so you can identify the photograph. 1. This photo might be from Nellis Park. Nellis Park was a city residential block on the west side of the city. I believe the boy in the middle of the street is Andy, with one of the Twins to the left. 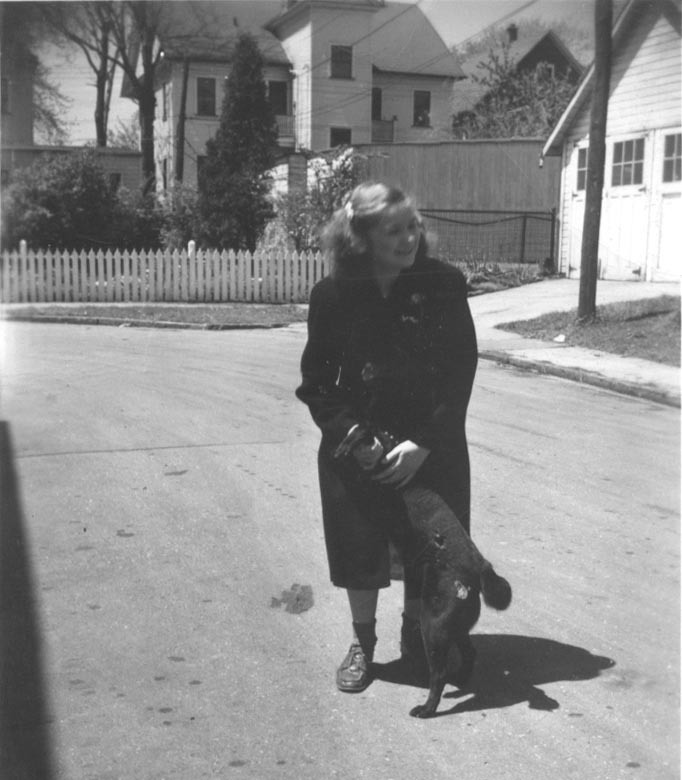 That might be Mom with her back to the camera, or a neighborhood girl - it doesn't look like Gail. 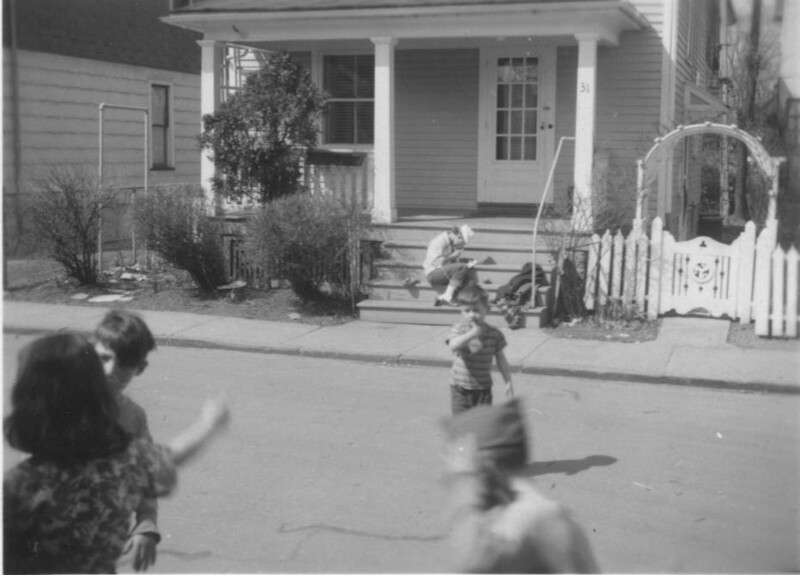 The blurred boy seems to have a military or scout cap on his head - it could be the other twin. 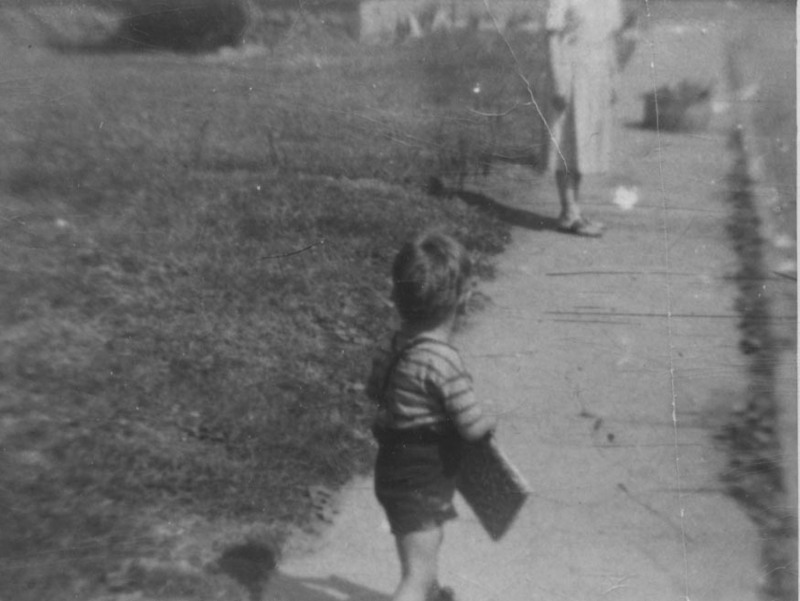 Given Andy's age, this photograph, possibly taken from our porch, was made around 1951. 2. This image was taken around the corner from the last one - note the house and gate in the background. This appears to be either Larry or Gary dressed in a costume - perhaps for Halloween since the trees seem to be bare. 3. 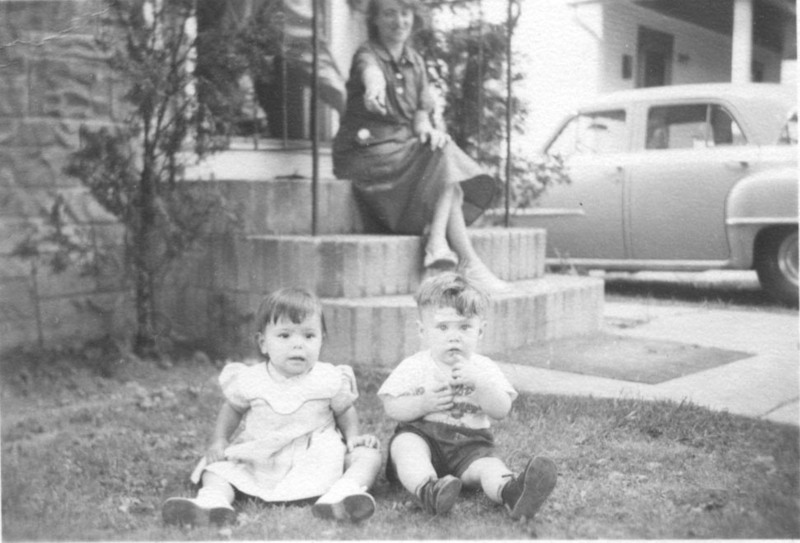 Gail, Andy, and a girl sit on some porch steps. The house number is close to the one in the first photograph. These might have been our porch steps. The man coming down the steps is also unknown - maybe Dad, but he was probably the one taking the photograph. Mom told me that the girl was "Lois". 4. Gail is with a dog - given the tail it must be Nobby (sic). I heard about the dog, but don't remember him. That garage behind Gail to the right will appear again. 5. There is the garage again, and if you look closely, the same dog to the left of either Gary or Larry. 6. What a great picture of Andy all dressed up! Might be Easter time or some other occasion that caused the neighborhood kids to get dressed up. I don't know who is "date" is, nor the other children in the photograph. The boy with his back toward the camera might be one of the Twins, but it is hard to tell. 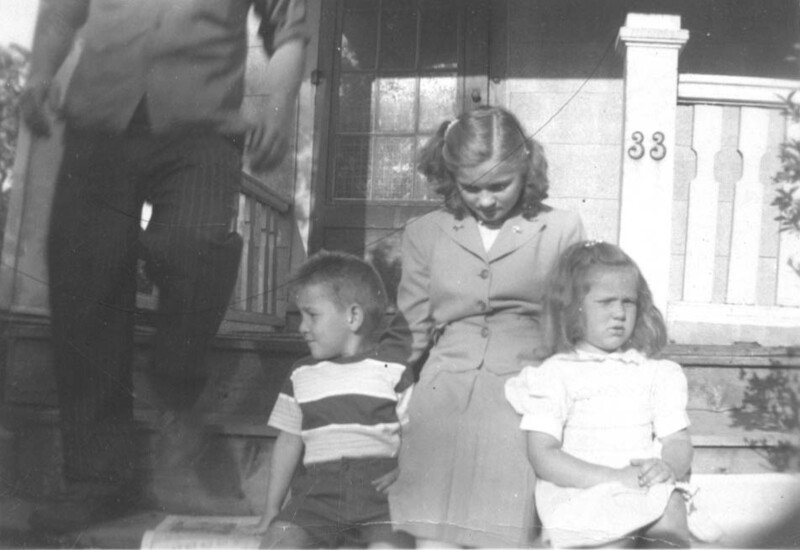 The older girl in the background looks like the one on the porch steps in photograph 1. 7. This might be on the opposite side of the block than the other photographs. The twins pose on the side walk near quite a row of bushes. I am not sure which is Gary and which is Larry. 8. 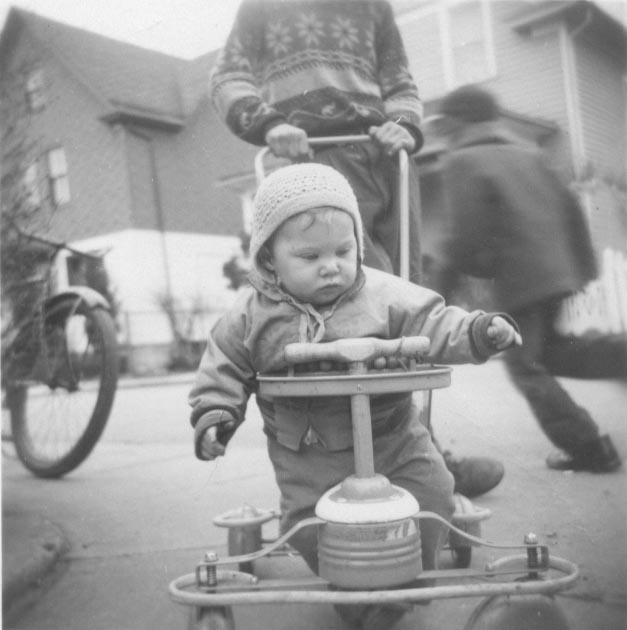 This is me (Tom) in a stroller. Not sure who is pushing me, could be one of the twins. 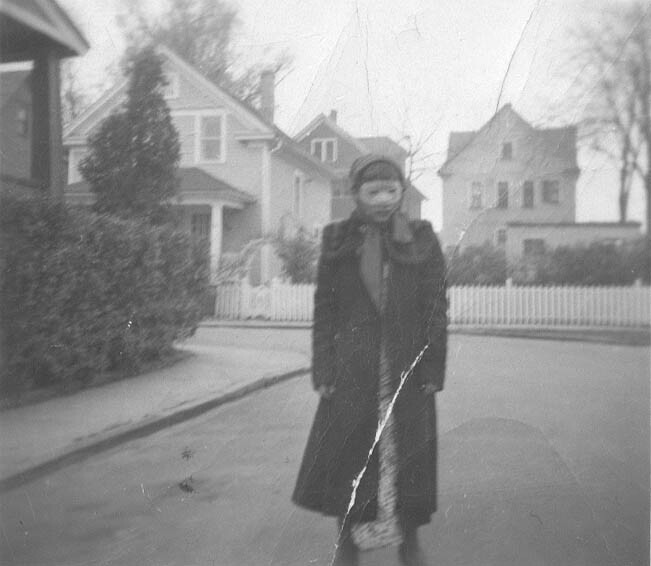 The two-toned house in the background looks to be the same as in photograph 1. (Please note- I have found another photo that shows this whole scene - including my pushers" head. See photo 12. 9. Another great shot of Andy, this time in front of those garage doors in the previous photographs. 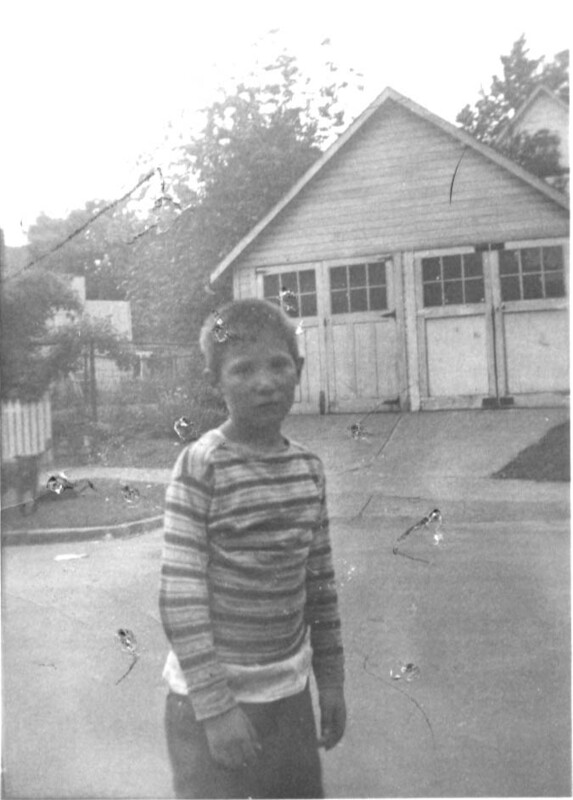 The younger boy is unidentified. Note the carved initials on the door - lots of "M"s. The smaller initials to the upper right of Andy seem to say "S.M. + G.C.". Gary Cook? 10. This photograph seems to be earlier, and could be in a different location. 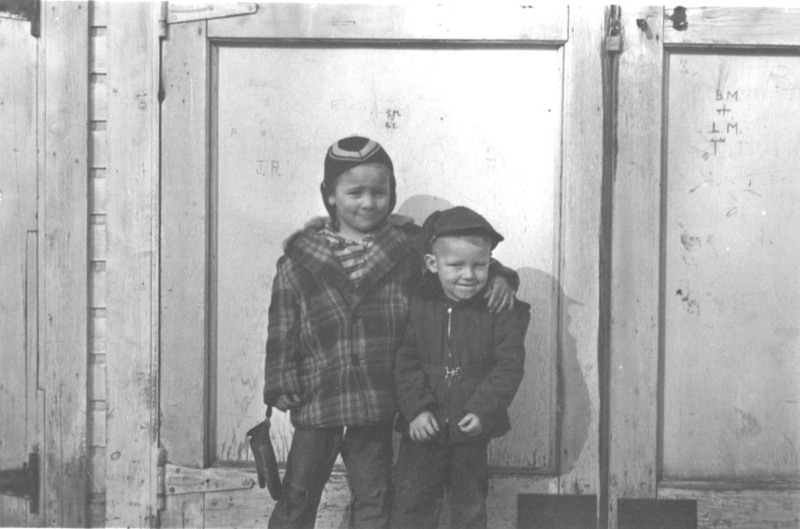 Mom told me several years ago that the young boy was me, though there is a possibility it could be Andy. The women, unfortunately, can't be identified - it could be Mom. There seems to be a large basket or bucket on the sidewalk near her. 11. I don't know if this was taken on Nellis Park or not. 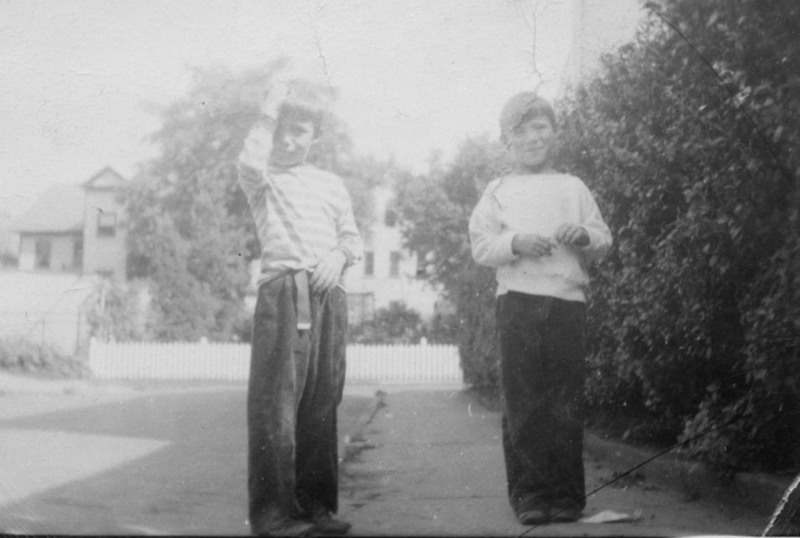 That is me on the right with a bandaged head - I think I fell on a little metal car. 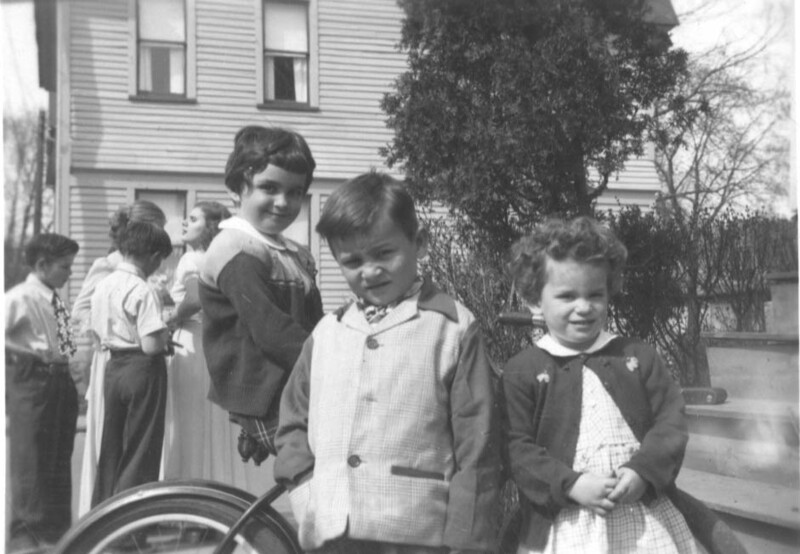 A similar photograph has the little girl identified as "Beverly" - it might be my cousin. Mom is sitting on the steps pointing at us. 12. When I was putting back the other photos used on this page I came across this image. It was taken the same time as #8, but from farther back. It was one of the twins who was giving me the walk around the block!